The cards I've shared with you so far this week, created with the gorgeous Perfect Peacock stamp from Stampin' Up!, have I hope, had you thinking a bit out of the box, they certainly did that for me! If you've miss any of them, you can catch them again here, here and here. I'll be back tomorrow with another Perfect Peacock creation, so I hope you'll join me then. Good evening Em, He is fabulous and looks so charming, gorgeous colours and design. Another fabulous card Em, I can't believe how many beautiful cards you have managed to make with this gorgeous Peacock. 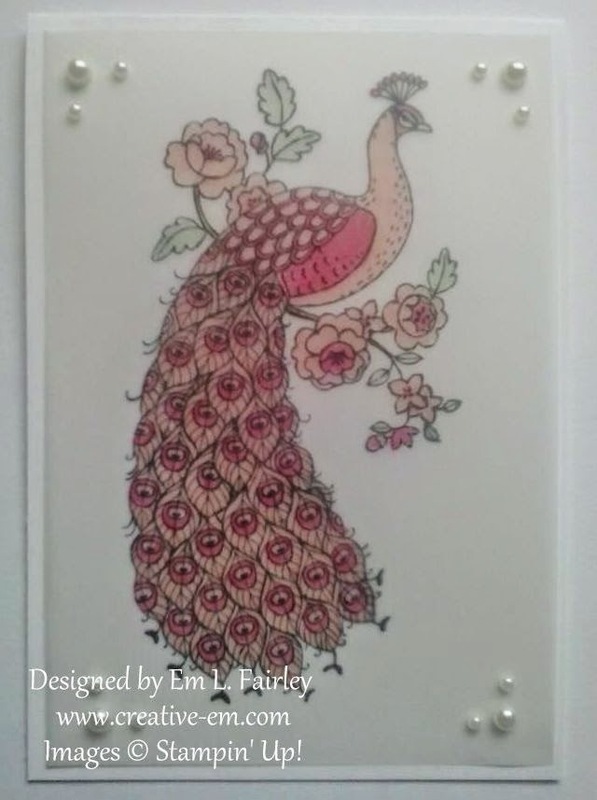 Another beautiful peacock card! Me thinks this one is a peahen though :-) Beautiful, rich and warm colours. Love it! Beautiful creation. I tried this same technique recently and I love the results. Your coloring is wonderful. Thanks for sharing, linking up with us and playing at AAA Cards!